The City’s last reorganization took place back in 2011, roughly a year and a half after Simon Farbrother was hired as City Manager. That restructuring was largely cosmetic though in that it didn’t dramatically alter the silos that had existed since the late 1990s (though the Financial Services and Infrastructure Services departments were later merged). This reorganization is all about getting rid of silos and breaking down barriers to more integrated service delivery. And the most notorious silo of all, Transportation, is now gone. More dominoes are indeed falling. Mayor Iveson spoke to the Journal about the changes yesterday, saying: “we’ve been talking about this for years; the transportation department, quite frankly, was very siloed and off on its own.” Well, no more. I had the opportunity to speak with Acting City Manager Linda Cochrane about the changes today. I wondered about the timing, given that a new City Manager could be coming on board in a few months and may want to make his or her own changes. 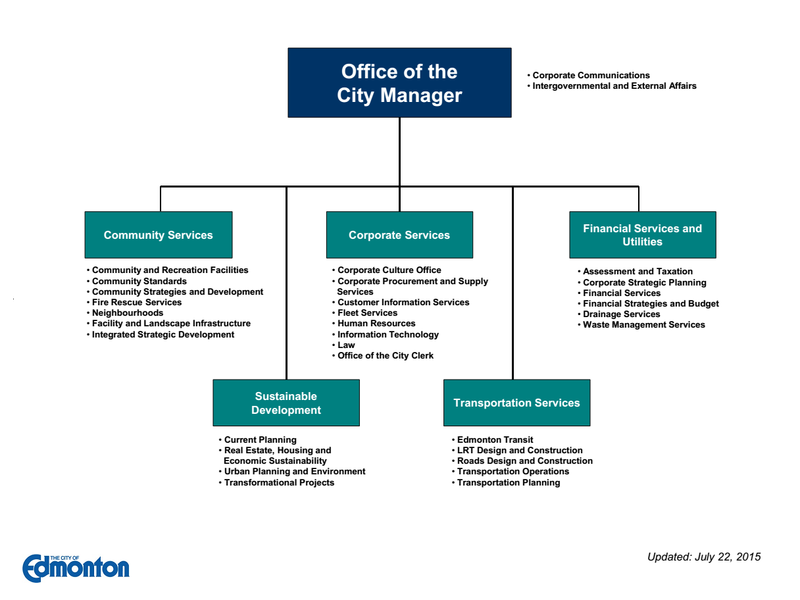 “That’s true, some things could change with a new City Manager,” she acknowledged, but said that “Council endorses the bundling of services in a functional way.” She feels there is “strong support” for the new structure. On top of that, Linda is very interested in the role herself and will be applying to become the new City Manager. 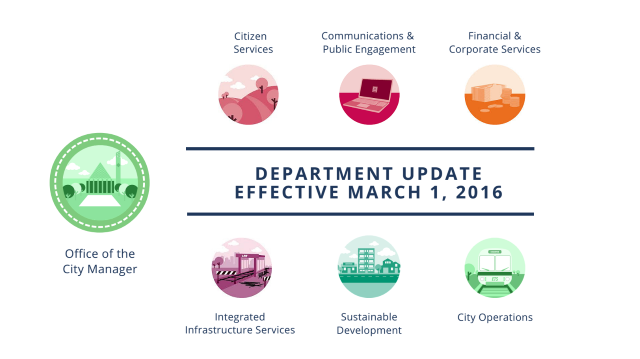 During last year’s budget deliberations, Council asked for a full service review of everything the City is doing. Couldn’t that have an impact on the structure, I wondered? “A structure based on function will facilitate the service review,” Linda said. “It will let staff and stakeholders speak in functional ways and that will further the 2% initiative too.” She noted that this structure provides a different lens through which Administration can work to find efficiencies. There are four principles that “underpin the development and implementation of The Way Ahead,” which is the City’s strategic plan. Innovation: A planning approach and operational culture within a municipality that encourages and enables continuous improvement and the exploration and adoption of new techniques, technologies, products and ways of operating in order to improve results and lead progressive change. Integration: A holistic view of strategic planning that acknowledges the interrelated and interdependent reality of complex urban environments. Livability: A set of interrelated factors that influence people in choosing where they live and reinforce their sense of well-being. Sustainability: A way of living that meets the needs of the present and does not compromise the ability of future generations to meet their own needs. The reality of the last eight years or so is that the City has been tackling these things relatively independently from one another. On some, there has been good progress. Livability is central to the City’s existence and much of the work of “The Ways” has addressed this. Council’s 2% and the changes in culture really address innovation. And with The Way We Finance, there’s been a good start on addressing the City’s sustainability. That leaves integration. Most citizens don’t think about the City in terms of the silos that have long-existed. But thinking about planning things vs. operating them is a pretty easy distinction to make. By bringing that citizen-oriented perspective to the City’s internal structure, there’s a good opportunity to integrate the work of the City to really have a positive impact. This won’t be easy. Just because a bunch of branches have moved into a new department that has the word “integrated” in its title doesn’t mean that magically everyone is going to start working together effectively. The leadership there has a difficult task ahead to break down barriers and really encourage that integration to happen. I think the other big takeaway is that Communications & Public Engagement has been elevated to its own department. It’s a major change for the organization. 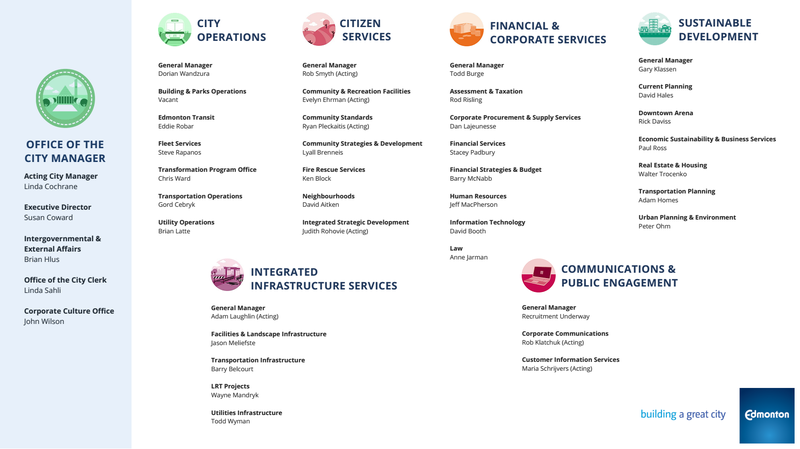 I think it makes a lot of sense for Customer Information Services (which contains 311) to be part of the same department as Communications and the Office of Public Engagement (formerly part of the Office of the City Manager). It’s about listening to citizens and talking with them just as much as it is about telling them what the City is up to. The Office of Public Engagement is quite small at the moment, with only a handful of staff, so resourcing it effectively will be a challenge. The good news is that improving public engagement has the full support of both City Council and Administration. The Council Initiative on Public Engagement has been underway since 2014 and just began Phase 2 a few months ago. Over the next year and a half, citizens will come together with Council, Administration, and other partners to improve public engagement in Edmonton. And the timing for this could not be better, with the full service review later this year, a municipal election coming in 2017, and a more complete review of the City’s vision and strategic plan commencing in the next couple of years as well. Effectively engaging the public will be important for all of these initiatives and more.